American automaker General Motors is known for shared pickup and SUV interiors and exterior stylings, but in the future, according to Chris Hilts, Creative Manager of Interior Design for the company, this will no longer being the case beginning with the 2014 model year. From this point on, new GM SUVs and pickup trucks will boast rather unique styles. 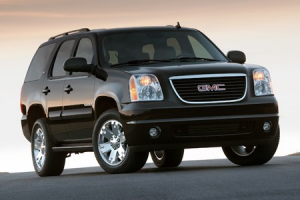 Impacted models will include such vehicles as the 2014 Chevy Silverado and 2014 GMC Sierra pickup trucks, as well SUVs like the Yukon, Cadillac Escalade, Suburban, and Tahoe, which all all due for redesigns. Particular edits will include unique consoles, instrument panels, materials, knobs, and more for each model. So, how big of an impact will this really make? Well, for example, previously the Yukon and the Escalade shared rather similar door panels. However, it doesn’t necessarily make a lot of sense to market similar materials to two different types of buyers and two different price ranges of vehicles. With different materials used for these models in the future, they will better cater to their particular drivers’ needs and desires. In another example, while the Tahoe and Silverado have always shared some rather obvious design cues, they’ll be completely unique vehicles in the future. That leaves a lot of room for some incredible improvements! The changes are being put into place due to the wishes of General Motors fans. In clinics, the auto giant learned that buyers waned their vehicles to be more unique. New SUV owners desired their vehicles to feel more like conventional passenger vehicles, while truck owners stated rather specifically that they wanted a more “truck-like” interior. Perhaps even more influential, however, is the fact that GM hopes to further differentiate its brands overall. To be specific, the company would like to make its luxury brand Cadillac stand out as providing a higher level of refinement, while also giving traditional American Chevy truck owners the experience they desire when stepping into their rugged, work-ready vehicles. Let’s focus for a moment on the 2014 Cadillac Escalade luxury SUV. The four-generation Escalade will be outfitted with a much cleaner style. It keeps its rather bold Cadillac grille, but it also receives a new headlight style and character line to give it a more refined aesthetic. It will feature an all-new glasshouse, with a blacked-out C-pillar that has a Cadillac emblem positioned near its base. Though specific styling cues for the premiere SUV’s interior have yet to be released, we expect it to get a lot more luxurious! Of course, the new Cadillac isn’t the only vehicle that will be hitting showrooms looking significantly different. Be sure to stay tuned here with your knowledgeable ReviewItOnline.net team for the latest SUV news and updates. And, remember, we also have in-depth reviews of the latest new models to help you determine which new vehicle is right for you. Search a particular model, or simply browse to find one that perfectly suits your style!